Avid followers of the La Leche League and readers of the Womanly Art of Breastfeeding, the way to feed my twins was never a question. We tandem feed even now and we exclusively breast fed from our first five minutes. Here are some tips for feeding positions, times, and those stress out times when even you just can’t take any more. Nourishing our babies from our bodies is a privilege known only to females within the mammalian species. Right from birth our babies get their crawl on to the breast, clawing their way to nourishment. We all do our very bet from the moment they’re on board to ensure all the nutrients they need for development are present. We continue this effect when we nourish our babies from the breast. When I began tandem nursing I knew daily intakes would be higher but could not find a location that compiled all the information. This is the information I found and compiled from serval sources, all listed at the end of this post. This information presented below is merely summarized from the resource list, updated for the most current information where available. As always, this post is purely informational and should not replace medical advice from your healthcare provider, lactation consultant, or registered dietitian. Protein is essential to the body as a source of nitrogen which is used to build bone, muscle, hair, skin, and major components of blood. Protein deficiencies show in the hair, skin and energy levels. I followed the Brewer Diet through my pregnancy and have continued this diet into lactation. The Brewer diet recommends 120 grams of protein daily to meet the demands of pregnancy and lactation. Per ounce cooked meat is approximately seven grams of protein. For example, one boneless, skinless chicken breast is 30 grams of protein. One large egg, cooked any style, is 6 grams of protein. A half cup of cottage cheese is 15 grams of protein. A one cup serving size of Greek yogurt supplies 12 grams of protein. Beans, nuts, seeds, cheese, meats, and fish all supply sources of protein. These sources also supply fats so it is important to choose lean cuts and opt for the high protein, lower fat sources. My go to snack for a protein boost is one cup of Greek yogurt, one half cup of berries or sliced strawberries, and a quarter cup of raw slivered almonds. This snack supplies a healthy fat source and 24 grams of protein. I love to love carbohydrates as we all should. The challenge to loving carbohydrates is consuming the correct type of carbohydrates and maintaining the correct portion size. We always think starch and sugar but while refined carbohydrates are the primary sources in most diets, the better sources are grains and fresh fruits and vegetables. Natural sources of starches and simple sugars include foods like rice, potatoes, breads, and pasta. These aren’t bad foods, you just have to know how they are made. Rice is an excellent source of carbohydrates and brown rice is better than ordinary long grain white rice. Couscous, quinoa, and millet are even more nutritious. Potatoes are a staple to every kitchen around the world. All the varieties of white potatoes are healthy but sweet potatoes and purple potatoes are even healthier. I love breads but find that whole grain or whole meal bread is healthier than ordinary wheat or 12-grain breads. Even healthier are sprouting grain breads. People everywhere love noodles, pasta is a favorite for adults and children alike. Consider eating whole grain pasta or brown rice pasta rather than traditional pastas made with semolina flour. The recommended intake of carbohydrates is 210 grams for the breastfeeding woman. Excess carbohydrates that are eaten are stored in the liver and if not used for energy are then converted to fat. Long term storage of these converted fats leads to fatty liver disease. Fiber is important for many reasons but one statement summaries most functions of fiber in the body: scrubbing bubbles. Dietary fiber works a little like those fierce bubbles from the television commercials, they pass through the body leaving it cleaner than before. Fiber binds to metabolic wastes, fats, and sometimes toxins and act as a carrier, transporting out through the digestive system. Fiber helps in maintaining consistent movement of the bowels and is essential to healthy bowels. A lactating woman needs 29 grams of dietary fiber from grains such as oats, whole wheat, quinoa, and millet. Fruits and vegetables often also have fiber content, just another reason to add an extra serving. As an image conscious society we frequently skip the fat for fear of weight gain. The body needs fat as an essential part of manufacturing vitamins and natural body steroids. As much as we may loathe eating foods with fat the focus should be more on finding and eating healthy fats that won’t be harmful to your health. Your total fat intake should be between 20-35 grams per day. Be wise and split your fat intake across several meals and snacks, choosing healthy sources of polyunsaturated fats. For instance, nuts, seeds, eggs, peanut butter, almond and hazelnut butters, avocado, cereals containing flax or hemp, broccoli, cabbage, collards, kale, tofu, and tempeh all contain healthy fat sources. Choosing lean proteins and fish are also great ways to meet protein intake while managing fat intake. My on the go Momma snack is one half cup of dry roasted nuts and berries mix. Packed with protein and healthy fats the mix contains almonds, cashews, peanuts, walnuts, and assorted dried blueberries, cherries, and cranberries. The mix provides about 13 grams of fat. Another great option is to top your salad with dried roasted pepitas for a little extra crunch and 7g of fat. Love chia seeds? Add 1 tablespoon to Greek yogurt the night before. Top with berries and one quarter cup of slivered almonds for 12 grams of fat and a healthy dose of protein and antioxidants. The B vitamins; biotin, folate, choline, niacin, panothenic acid, B12, riboflavin, and thiamin; as well as vitamins D, C, A, E, and K are listed as critical nutrients for the breastfeeding mother. Vitamin A is recommended at nearly twice the levels seen for pregnant and non-pregnant women. Vitamins E and K also have increased demands for the lactating mother. There is such a thing as too much of a good thing. Excessive consumption of vitamin C can lead to gastrointestinal disturbances, most notably gas and diarrhea. excessive consumption of vitamin D leads to elevated blood calcium levels which affects muscle contractility including muscle cramps and heart function. Vitamin A is stored in the liver and consuming too much may lead to liver toxicity as well as abnormal growth and birth defects. Choline, an essential nutrient in the B-complex can leave a fishy body odor and may cause liver toxicity if consumed in excess. The remaining vitamins; biotin, folate, niacin, pantothenic acid, ribolavin, thiamin, B6, E, and K; have shown no known negative health effects with overconsumption. While B12 also has no known effects, this may be due to lack of compiled data rather than no negative effects. Total body calcium contributes to strong bones and teeth. Calcium goes beyond the bone to free calcium that has an active role in muscle contractions and brain to nerve signaling. The nursing mother needs between 1300 to 2500mg of calcium each day. Great sources of calcium include cheese, yogurt, corn tortillas, calcium set tofu, Chinese (napa) cabbage, kale, and broccoli. Low blood calcium can lead to muscle weakness and impaired heart function, Calcium function can be impaired by consuming too much dietary vitamin D, most frequently from drinking large amounts of non-human milk. Consuming too much calcium can lead to kidney stones, muscle cramps, issues with heart function, and kidney disease. Copper is used to metabolize iron and is found in dietary sources such as liver, kidney, seafood, wheat bran, whole grains, and cocoa. Copper requirements are 1300-10,000 micrograms per day with higher levels causing diarrhea and liver damage. Iodine is essential to formation of metabolism hormones and overall thyroid function. Recommended levels are between 290 and 1100 micrograms each day and dietary sources include seafood, shellfish, crustaceans, and iodized salt. Consuming too much iodine elevates thryoid stimulating hormone causing acceleration of metabolism, irregular heartbeat, nervousness, and irritability. Iron: Used as the blood oxygen carrier molecule that supplies all the body tissues the oxygen needed for metabolism, iron is a critical mineral for blood function. While the quantity needed for a lactating Momma is half of the amount needed during pregnancy, iron is still a very important mineral to breastfeeders. The recommendation is for 10-45 milligrams per day and too little iron can leave you feeling tired, lethargic, and just run down all the time despite restful sleep. Eating fresh fruits and vegetables, especially dark leafy greens, as well as whole grains and nuts are the best sources of iron for lower fat, healthy calorie sources. Beans and meat are also sources of iron. Vitamin C acts as a cofactor assisting in dietary iron absorption when consumed together. Think spinach! Zinc is a component of multiple enzymes and has a pivotal role in protein synthesis for the tissues and cellular signaling. (Yep, cells talk to each other, picture a cell on a cellular phone…) Found in some seafood sources, red meat, and fortified cereal, the recommended intake is between 12 and 40 milligrams daily. Water: The last resource for nursing mothers is water. As a rule, I would have 8-12 ounces of water each time I nursed my babies. This meant I would consume at least 8-10 glasses of water daily. This, of course, is a minimum intake. Adding another 16-24 ounces at meals and another 8 ounces with snacks put me at another 8 glasses of water. Using this strategy I was able to take in 16-20 glasses of water each day. While water is preferred, milk, juices, tea, and broth in soups also count toward the total hydration. Water is important to flush toxins and waste products from the body and adequate hydration is critical in preventing mastitis. Keeping milk volumes with adequate water content ensures proper hydration in your baby too. 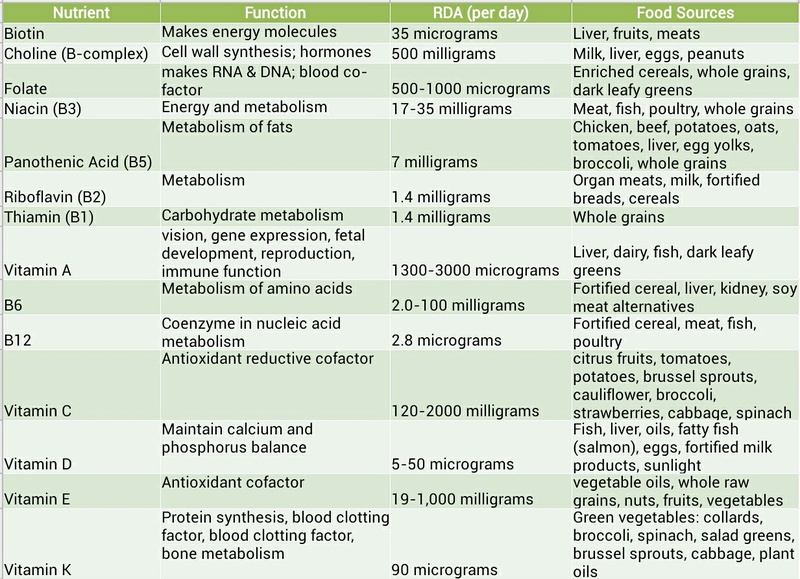 Dietary Reference Intakes for Calcium and Vitamin D . Washington, DC: The National Academies Press, 2011 . Nutrition Tips for Breastfeeding Mothers. University of California, San Francisco, Benioff Children’s Hospital, San Francisco. DRI Dietary Reference Intakes for Calcium, Phosphorus, Magnesium, Vitamin D, and Fluoride. National Academies of the Sciences. Food and Nutrition Board. Institute of Medicine. Standing Comitte on Scientific Evaluation of Dietary Reference Intakes. I think everyone could use a bit more of this information.